"There is almost a sensual longing for communion with others who have a large vision. The immense fulfillment of the friendship between those engaged in furthering the evolution of consciousness has a quality impossible to describe." How did the story of 'Communion by Joy Smith' begin? What lead you to this work? I have always loved art since I was a child. I studied some art history in college and dabbled in painting and drawing. 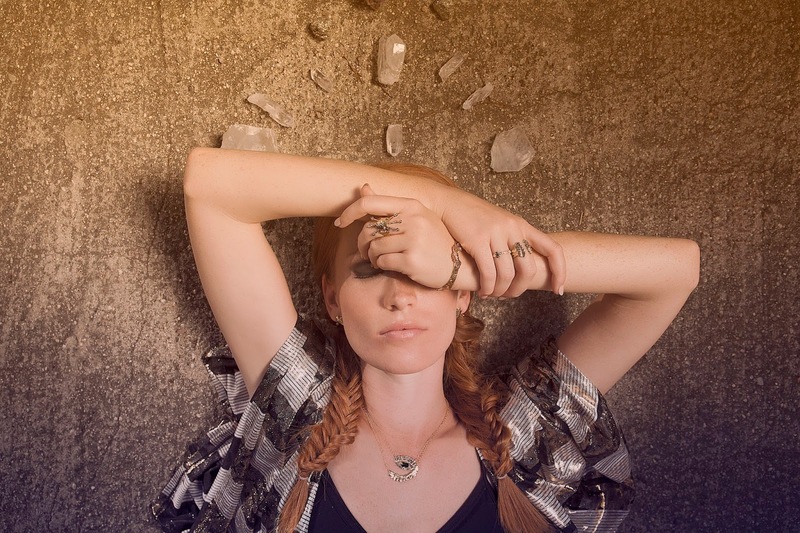 My calling for jewelry design came when I worked at an art gallery and realized that I wanted to be the artist and not just work for the artist. Can you tell me more about that? How/when/where did you learn the ancient practice of lost-wax carving? What spoke to your soul about using this method in particular? After work, I started taking lost-wax carving classes at night in Santa Monica to fill my creative cup and I was hooked! I loved creating each of my pieces by hand using this ancient technique and the idea of being able to sculpt anything I wanted was exciting! When I sit and carve I feel a spirit take over me and I get lost in the process, it is a beautiful meditative experience. I essentially drip and build up wax then carve away at the design with dental tools, files and sandpaper. How do you keep the creative fire burning? I look for inspiration in nature and the mystery beyond the veil of life. This is a feeling I try to capture with my designs. My pieces are laden with symbolism and intention. When I give my attention to life around me inspiration follows me everywhere I go. I love ritual and symbolism, the obvious symbolism is my take on wings or feathers. The clippings of wings in my collection are meant to embody the essence of protection needed on your journey for self-discovery. I find my inspiration communing with the spirit in nature, animals and people. I love to make jewelry that carries an energy of inner-strength and contains the power from the design or the stones I set into them. My process for keeping the creative fire going is by connecting to people and their stories. Mediating before creating your pieces is an important part of your process. How does your experience with mediation contribute to your life and work? I am a student of the sacred arts (folk magic) and many of my designs and inspirations stem from this practice of magic. I do my mantra meditation/ prayers in the morning which helps ground me and connects me to the spirit. I go over all things I am grateful for which helps me open up my heart and clear my mind. Also, I do most of my creative work in the early morning when it is still and silent. Besides meditation do you have any other rituals that feed your soul and nourish your spirit? Yes, I practice bhakti yoga, which is yoga of the heart. A union through love and devotion to the Spirit and practicing being present in all your relationships. Each vinyasa is a prayer with your body and you devote your practice to the spirit or someone you feel needs it. I also do kirtan chanting, which is a form of prayer and meditation for me. It's chanting Gods name or whatever you resonate with that represents a higher spirit. It is the fastest way for me to connect to the source where all inspiration, healing and love flows. My favorite kirtan artists are Krishna das and Govindas and Radha. Being a mother and an artist what lessons or examples do you hope to pass on to your daughter about work, art, LIFE? I hope to pass along that art and life are about living in the present and that having a relationship with spirit is important to help you get through life's hard times and the good ones as well. To listen to your heart before the thoughts in your mind, your heart will always guide you in the right direction. It's okay to make mistakes and to mess up, I create my best work this way. Don't even try be or look perfect, be who you are flaws and all because imperfection is beautiful!! Always be open, never judge and to give and receive! Can you talk a little bit about the new collection? 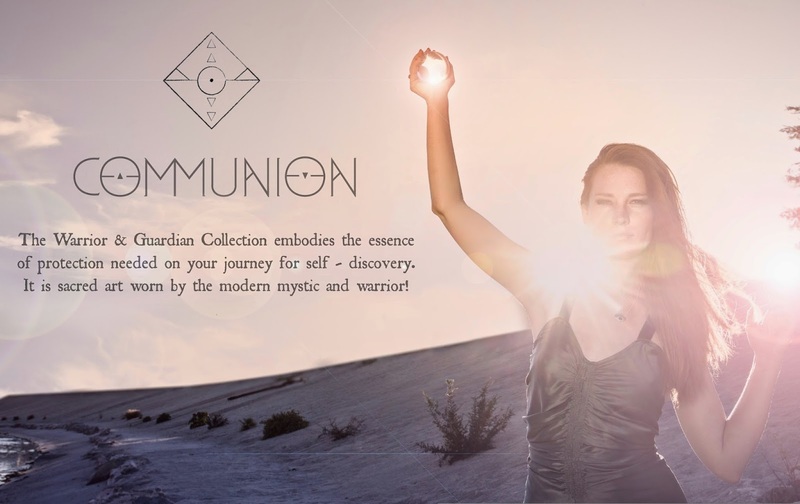 The Warrior and Guardian Collection embodies the essence of protection needed on your journey for self discovery. It represents your inner strength and the protection of the spirit. They are talismans infused with the highest vibrations to protect us on our journey in life! Now lets talk about this gorgeous look book! What was the spirit or essence that you wanted to capture for the look book? The essence of the look book represents the magic of the feminine. A woman who is a warrior of the spirit and stands in her power to reach the world. Her style is timeless and she is every woman. Women who wear Communion have a strong sense of self and portray that in their style. They consist of women who have a penchant for art, travel and the spirit of life. COMMUNION is the act of sharing one's thoughts and emotions with another or others; intimate converse. This is what I do as an artist, I share my emotions and thoughts with my customers and hope they can feel my essence in each piece. I am fortunate enough to own a piece of Joy's pieces and I can say with all my heart that there is a magic, strong femininity, and a radiant light that emanates from her jewelry. I have worn my Mini Warrior Pendant for weeks straight because I feel a sense of beauty and peace whenever I wear it. It truly is a talisman. All my love and infinite gratitude to Joy for speaking to us not only through her words but also through her beautiful and thoughtful work.